Croplands Equipment supplies a comprehensive range of agricultural equipment for crop management. Spray drift is a major concern in most agricultural areas today. The presence of sensitive areas located within close proximity to the spray target area introduces the possibility of off-target deposition. It is more important than ever that the agricultural industry demonstrates responsible chemical usage to reduce the need for severe application restrictions. In March 2010 the APVMA (Australian Pesticides and Veterinary Medicines Authority) issued new legislation in relation to spray drift management. Under these new label directives, users of agrochemicals must make an accurate written record of the details of each spray application within 24 hours following application and keep this record for a minimum of two years. Record keeping is not only a legal requirement, but a fundamental part of best practice in the field. With the increase in liability on farmers and growers due to drift and environmental impact, record keeping ensures a written record, which can be referenced should an incident occur in or around a particular area. In addition to this, detailed records are vital in the investigation of product performance. Record keeping of spray applications allows monitoring of successful pest and weed management, and acts as a tool for analysis of the effect of agrochemical applications. As part of a Spraywise initiative between agrochemical producer Nufarm and spray equipment manufacturer, Croplands, a spray log book has been released. The spray log book was authored by spray application specialist Jorg Kitt and offers farmers and growers a tool to record important spraying data each time they spray. Data fields include: weather conditions, product used, rates, mixing order and volumes, nozzle type and spacing, sprayer configuration and operator protection. Using this log book as part of a spraying procedure allows for proper identification of drift liability, meets QAS and APVMA requirements and also provides a history of fields and paddocks useful for rotation, use of soil residuals as well as disease and resistance management. 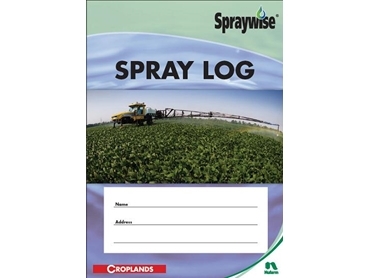 Spray log books can be purchased from Croplands.